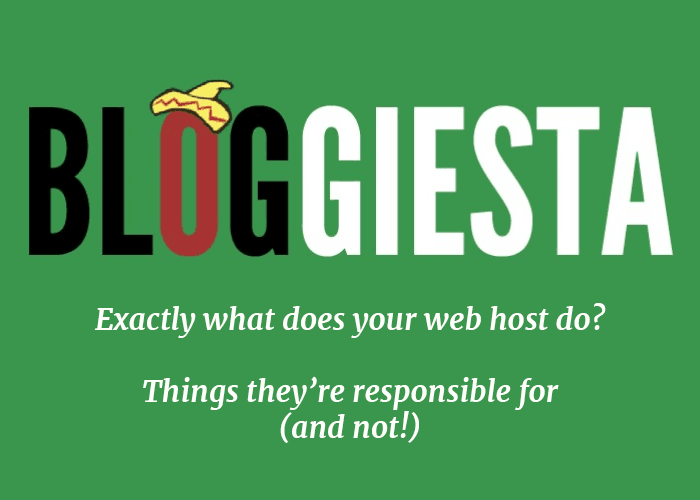 As part of Bloggiesta I’m here to talk to you about web hosting for self-hosted bloggers. A lot of people don’t fully understand what their web host is supposed to do. And in fact, it’s probably a lot less than you think. Hosting companies can decide to take on different responsibilities, and some will be more lenient and understanding than others. But let’s talk about the core responsibilities. Any host that does more than this is going above and beyond or has chosen to take on extra services. They provide you with space to build and store your website. You get storage space. This is where all your content (posts, comments, images, etc.) get stored and displayed from. They provide you with a portion of server resources to help serve that content to viewers (CPU, RAM, etc.). So, in short, they give your website a place to live and give you the resources to help display that content to people who visit your site. First you choose a web host and sign up for one of their packages. Then you need to install WordPress in your new hosting space. Many web hosts will have easy installers that just require a few clicks and a simple form (like site name, email, etc.). This is much like installing a new application on a phone or computer. When your WordPress site is set up, you can login with your username and password. From then on, everything you add to WordPress (posts, comments, images, pages, etc.) gets stored in your hosting account. That’s where all the data lives. A hosting company will have some kind of control panel where you pay your invoices and can set up your website. A lot of hosts (but not all) use something called cPanel. cPanel comes with different areas for navigating the files you’ve stored on your site, setting up email accounts, using scripts to install applications like WordPress, and so on. Part of the host’s responsibility is helping you navigate this area and use the tools they provide to get set up. Help you find your FTP details. Help you find and run the WordPress installer (if they have one). Help you set up an email account (if that’s a service they offer—not all hosts offer it). Now this is a vague category and I’ll explain some of the caveats in a bit. But in short, your host manages the server. It’s their job to keep the server online as often as possible. Every host will have the occasional problems and downtime, but their job is to minimize that as much as possible. Also a more behind the scenes job (and one a lot of hosts get lazy with) is keeping the server updated. Servers get updates much like your phone and computer does. These updates need to be installed by the host. Now we reach the “but” category! It is the host’s job to keep your site online, but it’s only their job to manage the situations that are their fault. Basically anything that you add or do to your site that doesn’t directly use their tools. You install a WordPress update and get a white screen of death. You edit your functions.php file and get a white screen of death. A plugin update breaks your site or makes something not work correctly. If your site gets hacked and it ISN’T due to a breach on their end (it’s because of a plugin/theme/WordPress or they guessed your password, etc.). It’s not the host’s job to fix WordPress issues, nor is it their job to fix website errors that you may have created or stumbled upon. If the problem isn’t directly related to the server that they’re managing for you (but rather the stuff that you chose to install in your space), then it’s not their responsibility. Some hosts do go above and beyond and will help you fix some of these problems, but it’s exactly that—above and beyond. It shouldn’t be expected of them (unless they specifically advertise this in their services). Some hosts do promise to provide backups, and if that’s the case, then they should. But with anything as important as backups, you should never leave that in someone else’s hands and assume it’s being done. Store your backups in multiple places. Regularly check your backups to make sure they’re valid and contain everything you need. Still looking for a web host? I offer a WordPress hosting service for book bloggers and authors who hate techy stuff. 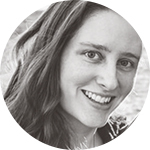 I take care of all the scary code, set up, and maintenance, so you can just chillax and blog. If you’re interested, you can read more about it or send me an email if you have more questions! What exactly is a backup? And how would I go about creating one? I’m still trying to figure out all the self-hosting stuff. If you have any posts about this I’d love to read them! A backup is a copy of all your content. So if you imagine your site getting totally deleted, you still have all that content saved somewhere. Unfortunately I don’t have a tutorial on creating a backup, sorry! You are just so helpful and informative! I really don’t think I ever would have switched to Word Press if I didn’t know how knowledgeable you were about all of this web stuff! I think my husband was kind of upset at first when I told him I wanted to hire you to migrate me, since he knows a lot of this web stuff, too. But I expressed that, being a book blogger, you would understand every little thing that I needed. (I remember when you changed your blog name but I can’t, for the life of me, remember what it used to be called!) Anyway, thanks so much for sharing all your wisdom with us. You’re the best!